The scholarship is the highest honor available to an entering freshman, with a total estimated value of $180,000. The merit-based scholarship provides full tuition, room and board, books, supplies, international study, networking opportunities, and other academic enrichment programs. More than 600 donors have given to the scholarship since its inception with a total of $8.8 million raised. “When donors give to the Legacy Scholarship, they are joining all the Legacy donors in believing Meredith has a valuable role to play in the future of each student. 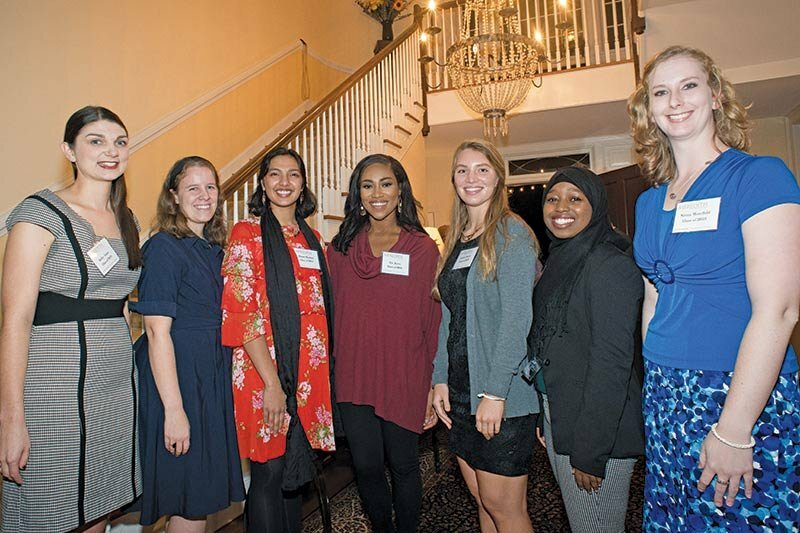 We have a responsibility to provide the means for each young woman to work with the excellent faculty and staff to find the best way to use her gifts,” said Ann Batson James, ’67, member of the Board of Trustees. Current Legacy Scholar Kirby Jones, ’19, has taken full advantage of the opportunities the scholarship has given her and feels she has been empowered both personally and academically by being a recipient. Jones has taken trips with other scholars to Spain, Belize, and the United Kingdom. All of these experiences gave her new challenges in different environments and she was able to learn about her own strengths, interests, and passion for global citizenship. On a local level, she also started a book club at Sanderson High School in an effort to expose students to texts that reflect diverse identities and backgrounds. Legacy alumna, Erin Huber, ’11, currently a national certified counselor at Page High School in Greensboro, N.C., spoke at the reception. “One of the biggest things the scholarship did was bring me out of my shell. I had so many opportunities to meet visiting lecturers and people in government, and to visit new countries. So after I graduated, I felt like I had the tools to handle almost any situation,” Huber said. The ultimate goal for the Legacy Scholarship Program is to raise $17 million, which will award the scholarship to four freshmen each year, with 16 scholars attending Meredith at any one time. Nine alumnae and six current students have received the scholarship since 2007.